According to the latest Social Media Statistics report from AlertSite, comparing several social media websites to find which website loads fast enough and consumes less time to load pages. 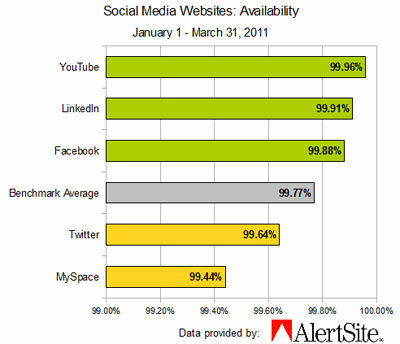 The social media websites which participate in this statistic report are Facebook, YouTube, LinkedIn, Twitter and MySpace. LinkedIn and YouTube hold the top two spots in availability. According to the report, the social media site increased its average page loading speed from 1.06 seconds at the end of 2010 to .75 seconds this quarter. YouTube follows behind it with an average response time of 1.46 seconds. In third place is LinkedIn at 1.69 seconds, and Twitter at 2.59 seconds. Facebook has improved in availability and page loading times, according to the latest quarterly report by AlertSite. Facebook’s improved performance, both in faster page load times and greater availability, becomes more impressive when you consider that the site has gained around 100,000 additional users during the quarter. Facebook’s up time during the first quarter of 2011 was 99.88 percent, meaning Facebook has moved above what AlertSite considers the benchmark average for response times, 99.77 percent. 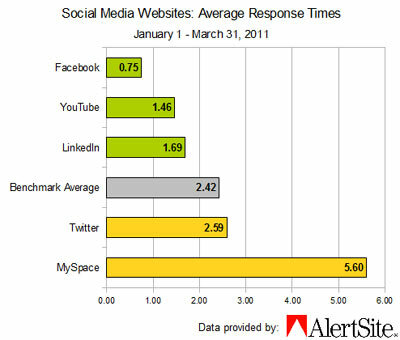 No surprises here: MySpace is the slowest responding social media site, coming in at a lagging load time of 5.60 seconds.